The currency of Quick Film Budget is tokens. You can purchase one budget for one token. The price of 1 token is $199 and the price of 5 tokens is $799. One token purchases a Quick Film Budget. The PDF file is delivered within 60 seconds and you can select to convert the PDF into a modifiable file in either Showbiz Budgeting, Entertainment Partners Movie Magic Budgeting, Microsoft Excel or iWork Numbers format. The modifiable file will be delivered within three days. Short film budgets receive a $50 rebate. "Every producer that calls me for an insurance quote has cost on their mind. Quick Film Budget provides a faster less expensive way of 'barreling' through it all while maintaining accuracy.Â I would highly recommend it." "Coming from the visual effects industry, I understood how to build a post production budget, but I had no experience in creating a production budget nor did I know where to start. Then I tried QuickFilmBudget.com. The level of detail in the film budget that QuickFilmBudget.com made for me based on my inputs was astounding. Even the post production section was accurate! I was amazed at how quickly it was generated and still customized to my parameters. 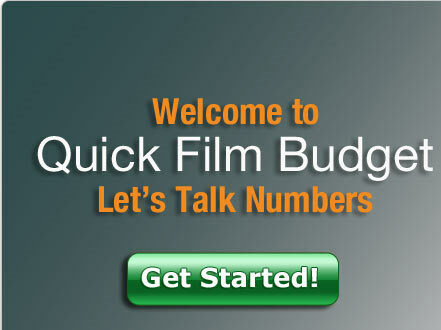 I would highly recommend QuickFilmBudget.com to anyone looking to creating an accurate budget inexpensively." "Quick Film Budget has great customer service and the best software! Especially if you are having trouble with finding someone to complete your budget or new to the industry, Quick Film Budget will save you the hassle!" Why Use Quick Film Budget? Filmmakers' time is valuable and their only alternatives are hiring costly Unit Production Managers or learning to use an expensive, complicated software program. Whether youâ€™re a professional screenwriter, director or producer or a first timer looking to break in, the process of creating a film budget could take a month. 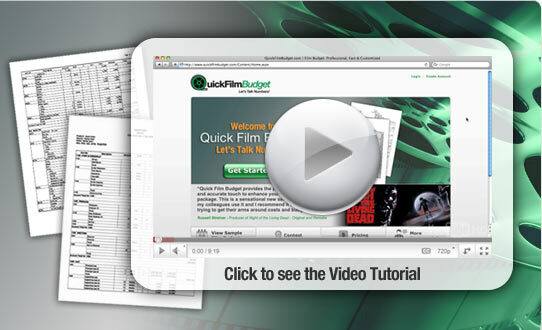 Quick Film Budget will generate your budget in a matter of seconds. You will quickly be on your way to creating the right presentation to show investors, producers or studios. Before you score your big spec sale or close any pay-or-play deal, there is no need to start spending big money on a film project. Film budgets can cost as much as thousands of dollars to create but Quick Film Budget instantly delivers a professional budget for the low cost of $199. How Does Quick Film Budget Work? Quick Film Budget allows the user to customize the budget specifically to his or her own screenplay or movie project details. Using information such as genre, location and final desired budget number, Quick Film Budget creates a full film budget that displays each category including guild rates, union rates, fringes and contingency costs. For instance, you want to produce a horror film for one million dollars shooting in New York City but arenâ€™t sure what to pay the cinematographer? Just select the genre of horror, click â€œNew York, NYâ€, and type in the desired budget of $1,000,000. Let Quick Film Budget create the budget for you! Other options Quick Film Budget considers for your particular film budget includes picture vehicles, animals, and child actors. Each completed film budget will include a personalized topsheet and a fully detailed production budget. The detailed production budget includes development costs, talent costs, prep period budget, shooting period production budget, post-production budget, financing costs, contingency costs and total above-the-line and below-the-line breakdowns. What Size Budget Can Quick Film Budget Create? Quick Film Budget can create any size film budget from short films to micro-budget features to studio size franchise movies. Quick Film Budget can create any size feature budget from $50,000 micro-budgets up to studio size franchise films. As the size of the budget increases, Quick Film Budget includes unions and fringes. All budgets generated over $1,000,000 include SAG, WGA, DGA, IATSE and Teamsters. Additionally, Quick Film Budget will allow you to know how much you can spend for every part of your film or digital production. This also provides you with a financial plan to assemble crew and cast actors. As a new option, Quick Film Budget can create short film budgets ranging up to $50,000. This can help students budgeting for a thesis project or a first timer looking to create a short film to enter into film festivals. Filmmakers can also use this budget as a template for web-series. For example, you want to produce a series of five webisodes for $10,000? Just create a short film budget for $10,000 and then shoot all five webisodes together. You can also create a budget for $2,000 and use it for each webisode. You can always further modify it after receiving it in the modifiable format of your choice to continue to customize it. Can I Modify My Quick Film Budget? Yes, within these four file formats, you can further customize any of the numbers or names. The process to obtain a modifiable file is that after receiving your customized Quick Film Budget PDF file, you can go to the â€œOrder Historyâ€ webpage. Next to the budget youâ€™d like to modify, click the Modify icon left of the Order Number. Then, you can select either Showbiz Budgeting, Entertainment Partners Movie Magic Budgeting, Microsoft Excel or iWork Numbers as a modifiable format. Quick Film Budget will then convert the PDF file into the format you have selected and email it to you within three days. Learn more about all of the film production terms used in Quick Film Budget.